In a hit-and-miss film littered with wildly uneven performances, one man stands alone. It’s not Matt Damon, nor Leo DiCaprio (yet to adopt ‘jaw-wired-shut and haunted with a slight moustache’ as his stock-in-trade) who, to be fair, give solid turns. It’s not Jack Nicholson, so over the top here that he makes Jack Torrance look as restrained as the girl who won’t talk from Corrina, Corrina. And it’s certainly not Ray Winstone, who mistakes a convincing Boston accent with speaking Cockney in a slightly lower register than usual. No, the man who steps up to the plate is Mark Wahlberg, inhabiting his Boston roots with utter relish as Staff Sgt. Dignam, and stealing absolutely every scene that he’s in in the process. Wahlberg hadn’t been this good since his mindboggling turn in Boogie Nights, and its arguable that he hasn’t been since, despite appealing performances in I Heart Huckabees and more recently The Other Guys. And just to confirm Mark Wahlberg’s absolute owning of the film, it is Dignam who appears at the end to plant the retributive bullet into the head of the treacherous Sullivan (Damon), and calmly exit stage left. Sgt. Dignam, I salute you. 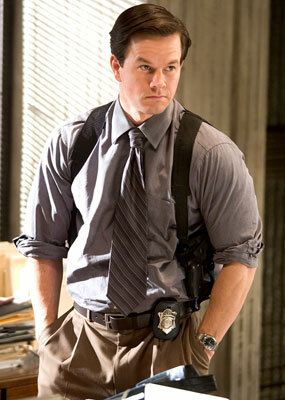 The Best of Mark Wahlberg as Sgt. Dignam on YouTube. This entry was posted in Characters that I love and tagged characters, Dignam, Justin Bieber, Mark Wahlberg, The Departed on October 26, 2010 by Ashley Clark.